A oil pump is seen at sunset outside Scheibenhard, near Strasbourg, France, October 6, 2017. 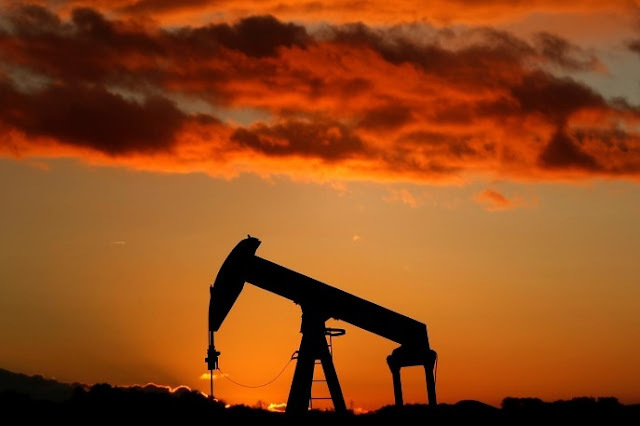 SINGAPORE - Oil prices were stable on Tuesday as OPEC said there were clear signs the market was rebalancing and as U.S. production remained offline following Hurricane Nate. U.S. West Texas Intermediate (WTI) crude futures CLc1 were trading at $49.66 per barrel at 0054 GMT, up 8 cents, or 0.16 percent, from their last close. Brent crude futures LCOc1, the international benchmark for oil prices, were up 5 cents, or 0.1 percent, at $55.84 a barrel. “There is clear evidence that the market is rebalancing,” OPEC’s secretary general Mohammad Barkindo told Reuters on Monday. “The process of global destocking continues, both onshore and offshore, with positive developments in recent months showing not only a quickening of the process but a massive drainage of oil tanks across all regions,” he added. Short-term price support was also coming from the United States, where some 85 percent of U.S. Gulf of Mexico oil production, or 1.49 million barrels a day, is offline in the aftermath of Hurricane Nate, the U.S. Department of the Interior’s Bureau of Safety and Environmental Enforcement (BSEE) said late on Monday. Oil prices were stable on Tuesday as OPEC said there were clear signs the market was rebalancing and as U.S. production remained offline following Hurricane Nate.